On chef Ming Tsai's first visit to Manila, he experiences Philippine fusion cuisine involving camaru, lechon, sinigang, foie gras, and Chilean sea bass at Museum Cafe. Ming Tsai toasts M Café and Chef Sau del Rosario. The first highlight of American fusion cuisine chef Ming Tsai's visit to Manila this week was a taste of our version of Philippine fusion cuisine involving camaru, lechon, sinigang, foie gras, and Chilean sea bass at modern Asian restaurant M Café last Saturday night, April 25 for a dinner thrown in his honor. Clad in a blue (his favorite color and the color theme of his famed Boston restaurant Blue Ginger) striped shirt, jeans and black sandals, Ming Tsai breezed into M Café last Saturday night with his Manila-based cousin, real estate executive Leighton Tsai, and Leighton's wife Linda, a life coach. Looking cuddlier than his formerly hunky TV self but still flashing his trademark smiling eyes, Tsai's affable persona that has made for good food TV for more than a decade permeated the restaurant the minute he walked in. That night he was also reunited with his colleague from 20 years ago at the Chicago Intercontinental, Terri Betia-Swager, and his former professor at Cornell, Tom Cullen, who was in town to visit his friends Tom and Annabel Wisniewski, owners of M Café. 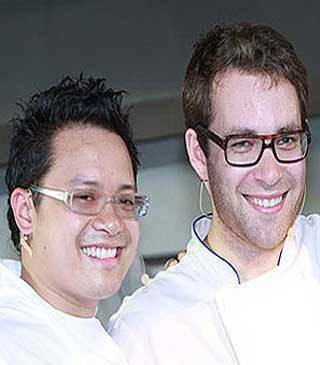 Former M Café chef Sau del Rosario who hails from Pampanga, engineered the "Country Filipino Cuisine" feast that night. On the menu, printed on little banderitas strung across the long table evoking a fiesta were Pampango favorites given a modern twist: Pica Pica Buru, fermented rice with crispy catfish and yes, sautéed crickets rolled in mustasa leaves; Pacu Ampo Paru, forest fern salad with prawns, salted egg, watermelon, fresh young coconut in a country vinaigrette; Sisig Pambuc Babi, pork bits with chicken liver, red onions and chili; Bulanglang Asan, or Chilean sea bass in a sour guava broth, Pugu Adobo Foie Gras, stewed pigeon in vinegar soy sauce topped with foie gras, quail egg and pickled vegetables; Litsung Bigak, stuffed suckling pig with green curry rice, and Tibok Tibok, native carabao's milk curd and purple yam cake. At the dinner table, all eyes and ears were on the 45-year-old celebrity chef and restaurateur who rose to fame in the late 90s with his Food Network show East Meets West, for which he won an Emmy Award. Tsai currently hosts two cooking shows, Ming's Quest on the Fine Living television channel and Simply Ming on American Public Television, and is the author of three cookbooks. While fellow guests dillydallied in a Fear Factor-like dilemma over the first course of crickets, Tsai was unperturbed and ate a whole mustard leaf-ful of the Pampango delicacy, saying, "They taste like beetles. "But he didn't have seconds. He gushed about the sea bass sinigang. "He inhaled it," observed someone sitting across him. "Is the sea bass farm-raised? "he asked. He devoured the sisig, left a little of the pigeon and foie gras on his plate, and proclaimed the lechon to be his favorite, along with the sinigang. "These are good portions for a tasting menu," Tsai remarked. He ate just enough of everything, even taking photos with his own camera. In the middle of dinner, he got up from his seat and surprised everyone by popping into the kitchen, to the delight of Chef Sau del Rosario and his staff. "What's that, is that a foam?" he asked one of the junior chefs making the dessert. Inevitably, photo-taking and autograph signing ensued between aspirants and idol. His old friends were not surprised, sharing their own stories of Tsai's magnetic personality. "He likes to do that because he knows what it was like to be one of them," remarked Swager, who worked at the Chicago Intercontinental while Tsai was Food and Beverage manager. "He's always been so down to earth, even back then. I went to his wedding, and he went to mine! And his kids, they're also such hams like their father." Recalls Cullen, who was Tsai's management professor in graduate studies in hotel management and hospitality marketing , "Ming was always crazy even back then, definitely a right-brain thinker. One day I walked into our class and saw him holding a banana by his ear. I said 'Ming, what are you doing?' He said, 'I'm on my banana phone.' And this was graduate school!'" He chatted with everyone at the table, even with us. He spent the day playing golf at Southwoods, he said, after which "I had a fantastic massage for what, $6! It's unbelievable. They came to my place! Tomorrow, two people will massage me. The day after that, I'll have three people. Then, it'll be time to leave! Think about it, you'll have someone massaging your head, your back, your feet–all at the same time!" he laughed. After the last course, Tsai stood up to propose a toast, congratulating Chef Sau and his staff and M Cafe for a wonderful dinner, joking that he should really stay longer in, or even move to Manila. Afterwards, melodious bell-jingling ushered in an authentic Sorbetes cart parked in front of the dinner table. Tsai had first dibs. "Hey, Sau!" Tsai hollered. "This mango ice cream doesn't taste dirty at all." 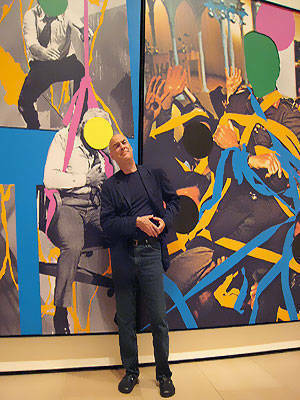 He gamely posed for even more photos until every one in the room, even the wait staff, had a souvenir of him. Then, at around 11 p.m., Tsai had to go. 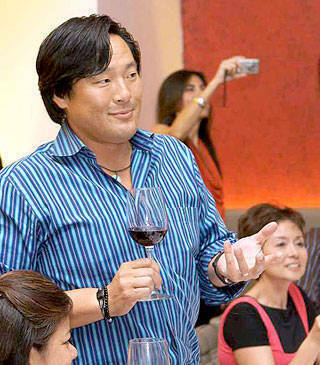 Together with his cousin and some newfound Manila friends, Ming Tsai was off to Establishment. Photos by Michael Wisniewski, Terri Swager and Raeanna Cranbourne.